Wundt enthused over Fechner’s law and attempted to extend it. Instead of a link between stimulus and reaction, he went as far as to envisage an interrelationship between stimulus and sensation, although this was never convincingly formulated. Fechner’s relationship is not, in fact, a law in the truest sense of the word, but at best an approximation of the actual circumstances. After initial enthusiasm, therefore, psychophysics has become something of a fringe science. 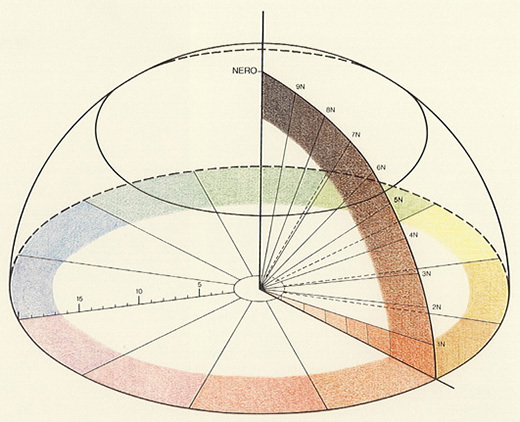 Wundt involved himself exhaustively with colours and actually designed two systems, both of which were conceived out of the principle of opposition (which can also be derived from the polar attributes of the empirical world such as excitement and calm, or well-being and pain). 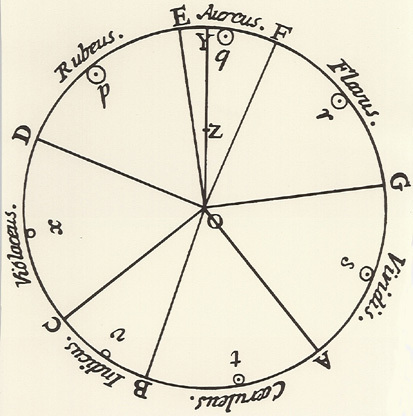 In addition to an initial sphere-shaped system dating from 1874 which leaned towards the Forsius diagram, Wundt envisaged a conical construction reminiscent of Chevreul and Lambert. He introduced this cone for the first time in 1893 in the second edition of his «Vorlesungen über die Menschen- und Thierseele [Lectures on the Soul of Man and Animals]». 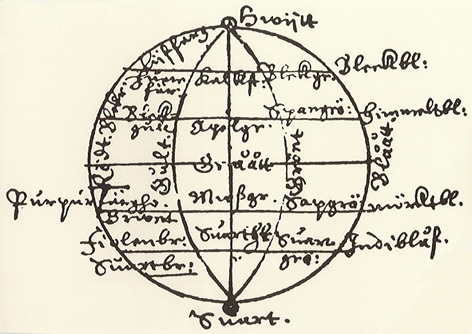 It is absent in the first 1863 edition; it is not known why he actually decided to include it, since by 1874 he had already described his considerably more informative sphere (illustration). 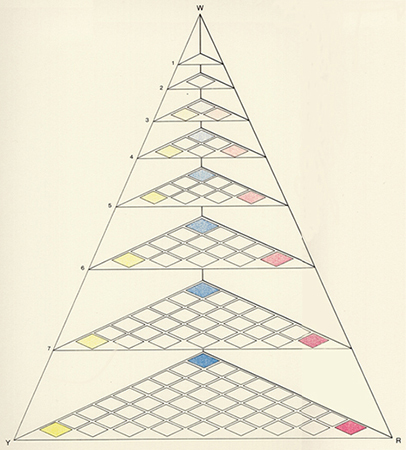 Wundt’s main interest was in colour-systems. 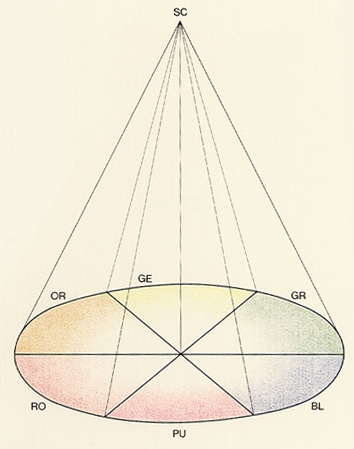 He wished to learn more about the process of perception — those conditions of consciousness «which cannot be separated into more simple components», as he wrote in Physiological Psychology, which also contains his colour sphere: white (WE) and black (SC) are placed at the poles, and the equator comprises eight colours-green (GR), green-blue (GB), blue (BL), violet (VI), purple (PU), red (RO), yellow (GE) and yellow-green (GG) — which form a circle with grey at its centre. 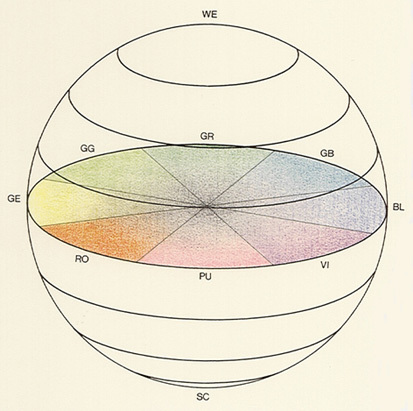 Wundt also noted that «if this representation of a sphere is random, inasmuch that instead of it another embodiment with similar properties can be selected, the psychological fact that the entire system of light sensations is a three dimensional and self-contained continuum will still be vividly expressed within». In the case of the colour-sphere, it is possible to move away from the largest cross-sectional surface (through its centre) in two directions; with the cone, there is only one route, running from the white centre of the circular base up to the black tip. This circular base accommodates only six colours: yellow, green, blue, purple, red and orange. Naturally, the result of this restriction is that different colours will oppose each other in each of Wundt’s systems. 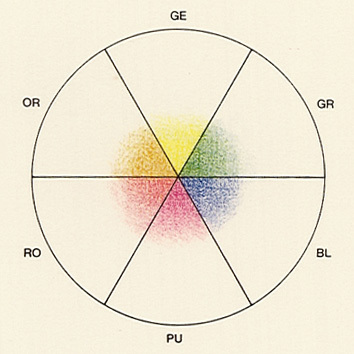 The number eight plays a distinct role in both of Wundt’s arrangements: a total of eight colours appear in the cone, with eight colours again appearing in the largest cross-section through the centre of the sphere. In fact, if we take Maxwell’s three primary colours as a basis, there will be eight basic colours representing the outer limits of the eye’s perception of colour. From three components, eight combinations can be produced to which both black (which does not contain a primary colour) and white (which contains all three primary colours) belong. At this point a special note is necessary with regard to the concept of the colour-circle appearing in both of Wundt’s systems, which can of course be traced back to Newton. It seems extraordinary to have continued to portray colours by means of a closed circle after knowing that the visible electromagnetic spectrum (between 400 nm [blue] and 700 nm [red]) is open ended. But the colour-circle does not, in reality, exist; it exists only in our minds — the constructive achievement of our perception. Colours show that our perception is actually both selective and constructive-selective, because not all of light’s wavelengths are received by the eye; constructive, because qualities (colours) arise from physical stimuli (light of varying wavelengths). By mixing two wavelengths, which remain separable physically, a third colour is created which, from the physiological point of view, is not separable. White and purple can here arise only by mixing (and not as pure colours). We can still ask why our eyes are sensitive only to those wavelengths between 400 nm and 800 nm. We can find the answer in the atmosphere, which only permits the penetration of restricted wavelengths. The atmosphere of our planet is actually an «optical window» which, for all practical purposes, corresponds to our sensuary perception. Our eyes are thus sensitive to just that section in which the electromagnetic spectrum of light reaching the earth is at its peak. 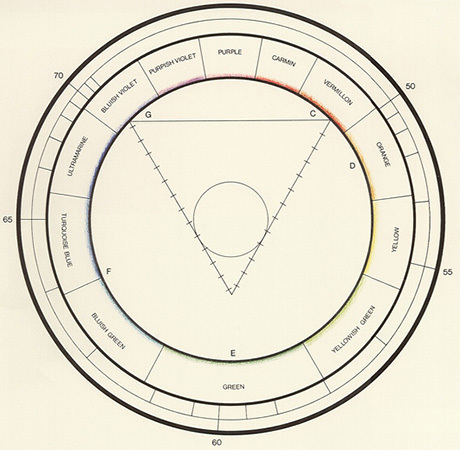 This maximum is in the green area, in the middle of the spectral colours — and the same area to which von Bezold assigns the greatest space in his circle. Biologists speak here of the «adaptive character» of perception. The only radiation to reach us is the light which we see. 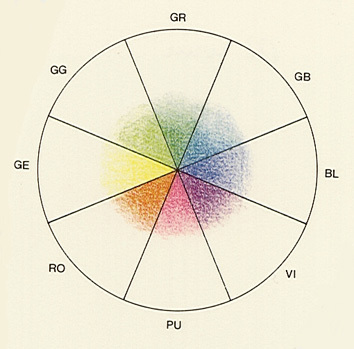 Date: Between 1874 and 1893, psychologist Wilhelm Wundt introduced two different colour-systems in his lectures.